Wild Horses is a Creation that adds wild horses throughout the wilderness of Skyrim. You can tame them and purchase saddles from stablemasters. The Creation also adds a unicorn, brought back from extinction by the Psijic Order. It was released on October 4, 2018 for 500 CC Credits. This Creation was made by fadingsignal. 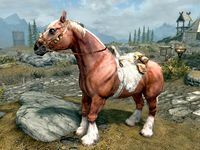 Traveling through the wilderness of Skyrim, you can now find wild horses to tame. Grab a map of sightings and a Detect Life spell to aid you in your search, or just set out into the wilderness! Once tamed, there are a selection of saddles you can purchase from stablemasters. The naturalist Soran Hariksen even claims to have seen a unicorn in the deep forests. This Creation adds the ability to tame up to seven wild horses after completing the quest Horse Whisperer. A Unicorn can also be tamed at the conclusion of the quest Creature of Legend. Once tamed, wild horses will return to where they were originally found if you switch to a different mount, except for the Unicorn which will instead return to the College of Winterhold. This Creation also expands on the functionality of stables by adding the ability to purchase cosmetic saddle options as well as give your horse a randomized name. Both of these options are available to all horses, not only those that you tame.